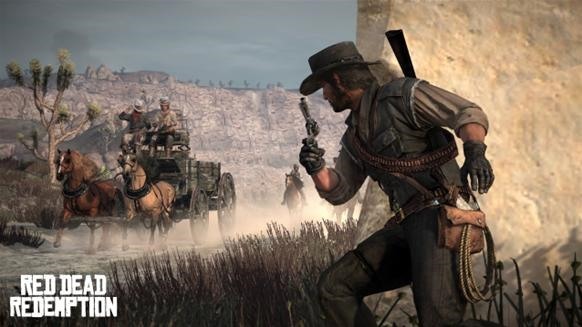 Red Dead Redemption is hard to pin down in game play and story. 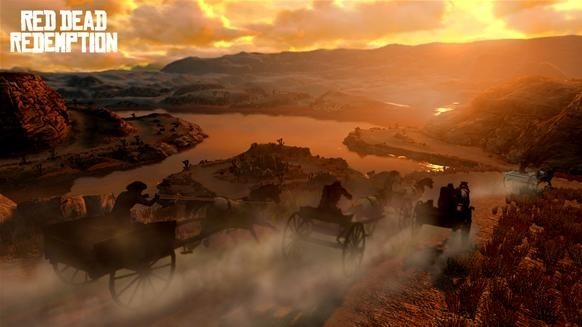 The game offers this massive multi-layered world in which the player can roam freely, offering plenty of challenges, beautiful graphics and atmosphere for the player to experience. Yet after some point the whole world feels barren and unchangeable, and your achievements are nothing more than a trophy that does not matter in the sandbox world the player resides in. The story, told in three arcs, offers an inconsistent narrative of strong emotional scenes mixed with watered down and story-padding missions. The story and the game play are rigid and unchangeable, perfect for a short play-through but difficult to finish in the long term. For a sandbox game, the graphics and atmosphere in RDR are breathtaking. Add fluid animations for both human and animal NPCs and the game can quickly draw a player into the game. The game has a day and night system and most missions can take place throughout various times of the day, making one mission look different the next time around just on the conditions of the day. 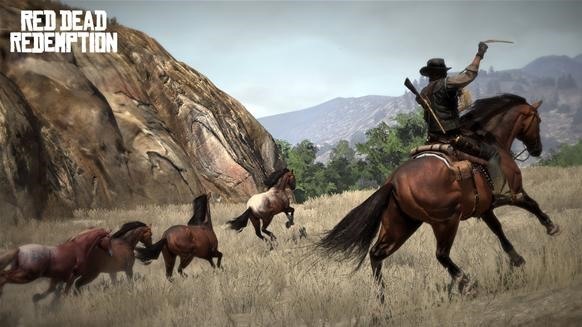 Taking your horse through a stroll, taking in the long vistas in the game while the wild life and random strangers pass you by can create memorable moments outside of the story. A particular favorite of mine is when there are patches of sun reflecting on the grass and thunderstorms. The game is beautiful to move through. The world in Read Dead Redemption is unchangeable with limited interaction and this works well for large scale game play. In sandbox games, areas that never deplete or change are necessary if the player is to have the ability to visit the same location an unlimited amount of times. In Red Dead, certain animals always roam within a certain vicinity, plants re-spawn after a couple of days, and bandit hideouts reset for the player to have fun playing through them again. Towns refresh their NPCs after murderous rampages so that the player can always come back and continue without breaking the game. The complacency in everything always being the same is what also hurts this game in terms of progression. A sandbox game cannot just be a template and be taken in the literal sense. There should be things in a sandbox game that change. This is important if the player is to feel that the things he/she has done mattered in the game world. Oblivion and Fallout 3 are sandbox games with such consequences. If in these games the player went on a murderous rampage, the game would keep that outcome, and the bodies will remain. The NPCs, special and common, would not reset. The actions taken in these worlds have consequences, and when you take that away from a game, then nothing that you do matters. There is no feeling of remorse about killing what will be there the next morning or two, or happiness in saving someone that will be alive regardless when the player logs in. The way Red Dead tracks progression in the game is an old one. It is the way plat formers track progression in their worlds: with scores, numbers, milestones, and trophy rewards. Just like in plat formers, another game type where everything stays the same and the only way a player knows they are going forward is by a numerical statistic. 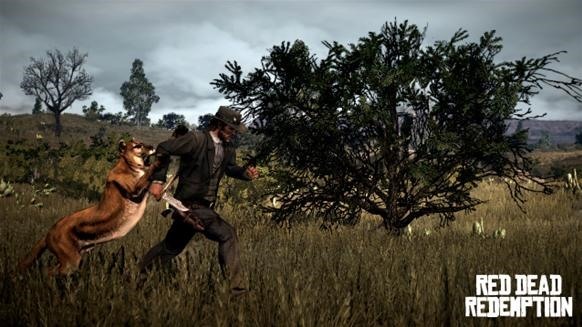 In RDR, the game keeps track of all your actions, and rewards you for reaching goals, such as kill five birds or harvesting a certain number of plants. Besides progressing through the story missions, this is the only other way the game lets the player know they are going forward. This type of numerical progression is great for the selfish player that only cares to increase the statistics of their own character but devastating for the player that wants to be part of the sandbox world. 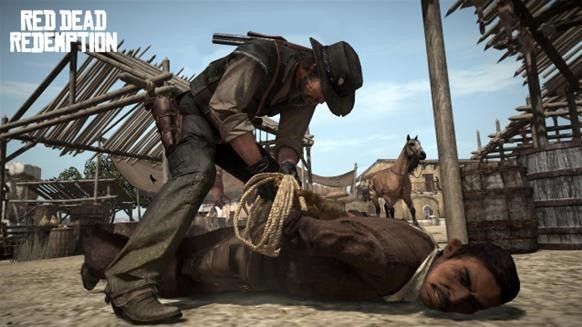 Things that would have been fun like owning and managing a ranch (outside of the missions), buying businesses, trade, building relationships with permanent NPCs (instead of seeing them in missions only), building a posse or taking the job as a sheriff of a town, these are things that would have made the game more than just a template sandbox. While it is unfair to judge a game for things someone wished would be included in the game, it is not unfair to require at least some aspects when other games like Fable 2, Oblivion, Fallout 3, have similar things like those mentioned above, and well implemented. In terms of character interaction, morality and actions are also fixed for the player. The game prides itself in the most basic denominator: you can shoot anything, anywhere, any way you wish. Shoot people point blank in the face, or the crotch, up close for a fatality type finish, be it man or woman. You can rope a person and drag them, or tie them up, leave him or her on the train tracks, put bait and watch the animals eat the person alive while they get hit by the train. Violence is the extent of the interaction you can have with NPCs. They can't be a friend, a worker, a love interest, a party member of your posse, just a target. The game will never let you have an affair, or anything sexual for that matter. There is a line drawn and it's disconcerting that violence is ok but adultery, friendships, or relationships are not. In multi player, the flaws of this sandbox game are more apparent because it does not have the story to cover the lack of content the world offers. There are hideouts that you can take out endlessly and basic PvP modes. That's it. To make up for these barren offerings, the game again uses a number progressions to reward the player. The more you do, the more you will unlock special titles or hidden characters. Once you reach level 50, the game then asks you to do this four more times, repeating what was already repetition over and over again. As a sandbox game, RDR is disappointing. Only offering the bare minimum in a world that is set to always be the same, and after a while the interest is lost. But the sandbox world works great when combined with the story because as the story progresses, it gives the player many ways to approach or solve a problem. In this regard the game play shines. If you think of RDR as an open ended adventure game it is perfect. With a wide canvas that gives you many options in how a mission is started or finished, it makes RDR fun. For example, you can go around the bandits and take the high ground on a mission, or go in on your horse, guns blazing. If you want style try finishing a mission where you hogtie and not kill anyone, or finish a mission while always riding a donkey. As an adventure, where the sandbox world is mixed in with the story missions, you get a sense that this is how the world is suppose to be experienced. More on the story in part 2 of this review.